Greatly changes hydraulic shovels into grass mowers. Simply mounted for ease of mowing. ※ The operation efficiency ranges are attained on the condition that the running speed of the mini shovel is 1.0 to 1.5 km/h. Ease of mowing with a hydraulic shovel utilized. Mowing on riverbeds, bank, and road shoulders and slopes. Weed cutting on golf course and skiing slopes. Weed cutting on construction sites and removal of bamboo grass and shrubs from forests. Mowing on paddy fields, fallow fields, and other farm fields. Cutting of the hedges on road median strips. Mowing on parks, health resorts, green belts, and unused land. Front mounting type for ease of attachment and detachment. Conveniently offers a wide variety of mowing styles while running or rotating your tractor or moving the boom back and forth. Mounted to 3- to 4.5-ton-class mini shovels and 0.25- to 0.4-m³-class hydraulic shovels. Mini shovels can be utilized for multiple purposes with improvement in operation efficiency. Equipped with a floating link between the mower and arm. The mower is in floating control according to the undulation of the ground, thus realizing comfortable work without mower angle or height adjustments. Moreover, no excessive force is imposed on the hydraulic shovel or mower, which ensures safe mowing. The attachment direction of the mower can be selected according to each type of work. The attachment direction of the mower can be selected with a single pin, which offers a wide variety of mowing styles while running or rotating your tractor or moving the arm back and forth. Incorporates a roller on the rear of the mower. The mower is supported with the roller with a reduction in work resistance, which mitigates the sinking of the mower into soft-ground areas, thus not damaging the land surfaces. 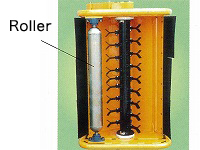 Furthermore, the roller can be detached with ease according to the application. Ensures ease of hydraulic extraction, provided that breaker piping is used (or the piping is used for breaker purposes as well). The mower and hydraulic shovel are connected only with two hoses with the adoption of a hydraulic motor that does not require drain piping. The rotating directions of the hammer knife (i.e., the forward and reverse direction) can be selected at the flip of a switch at hand, and any type and height of grass can be cut finely and neatly. A standard model (with ST specifications) with a hammer knife of single-directional rotation type is available as well. Incorporates an optimum hydraulic system for mowing. Incorporates a dedicated valve that supplies a constant quantity of oil to the hydraulic motor along with a variety of switching valves in order to ensure the best rpm of the hammer knife for powerful and stable mowing. The lightweight mower ensures well-balanced mowing with the boom stretched to the maximum. Provided with a protection cover each to the front and rear of the mower to prevent stones splashed around and ensure safety. Read the operation manual carefully and be sure you understand the information provided before attempting to operate the product. Do not use the product for applications that may cause you to topple down or fall. The improper operation of the product will shorten the life of the product and may result in malfunctions and accidents. Do not stand on the front, back, left-hand side, or right-hand side of the mower. Be sure to wear a helmet and eye shield, and to keep the safety of operation in mind at the time of work. Be sure to make a commencement-of-work check in order to prevent malfunctions and accidents. Copyright(C) 2016 Sanyokiki Co., Ltd. All right reserved.